KawaiiPunk - Kawaii Mascot Blog: Painting Problem! Cubist Mascot! Amazing! As you can see the Cubist Mascot has decided to draw a picture of the Eighties Mascot. And, if you ask me, I reckon he’s done a pretty good job! But wait, it looks like the Cubist Mascot is having a bit of a problem choosing the right set of paints to colour in his drawing! Disaster! But wait again, maybe you can help! 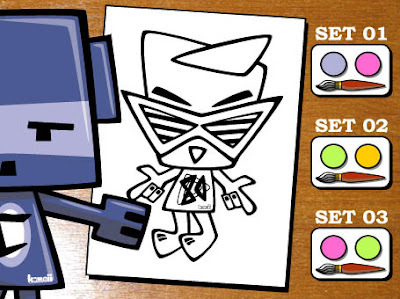 Can you work out which paint set the Cubist Mascot should choose to colour in his picture of the Eighties Mascot? The answer, as ever, will be revealed in this month’s monthly round-up!